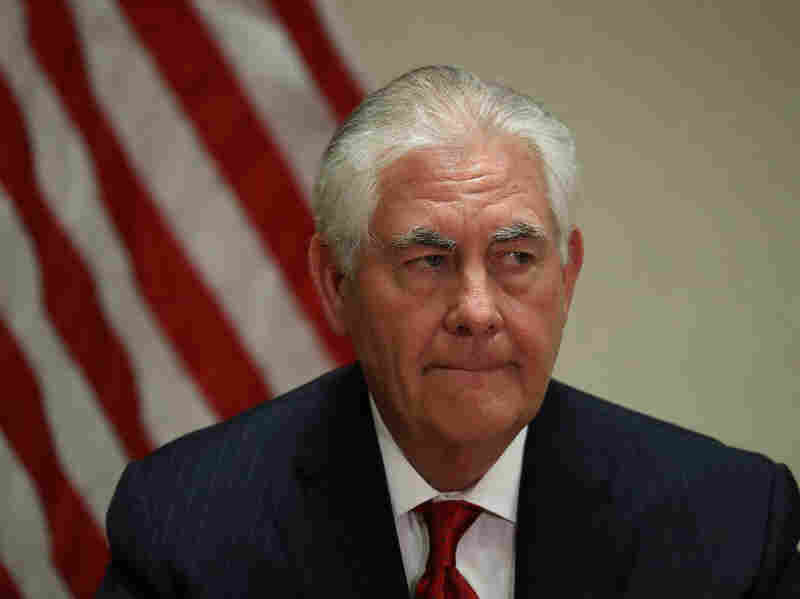 Travels — Or The Lack Thereof — With Rex Tillerson Should the secretary of state travel with a press pool? NPR's Linda Wertheimer thinks it would be good for Secretary Tillerson and the public if he took the media along on his trips. Secretary of State Tillerson speaks with the media after he greeted Chinese President Xi Jinping on April 6 in West Palm Beach, Fla. Since we've been paying a lot of attention to turnarounds by President Trump this week, I'd like to propose that one of the president's men would benefit from a reevaluation of his position on at least one thing: the news media. The secretary of state, Rex Tillerson, has apparently decided he does not need to travel with an entourage of reporters as his predecessors have done — one or two are sufficient in the new secretary's view. He has also reduced the number of staff and advisers who accompany him, and reduced the size of the aircraft in which he travels, from the Boeing 757 to a 737 to save money. Lots of folks might see this as a campaign promise being kept, downsizing the importance of the State Department; reigning in the influence of the correspondents who have made a career of covering American diplomats. The reporters who travel with the secretary do pay their own way and it is not cheap. But the most important thing about this decision to leave the news people behind is the message that it sends. It sends the message that when Secretary Tillerson is meeting with world leaders, what is said and what happens is none of the people's business. The reporting on Tillerson's travels mostly comes from his own official statements, which may or may not be all we the people need to know. Perhaps Mr. Tillerson's last job has influenced what he does now. He was the CEO of ExxonMobil. Corporations like his are not given to sharing. But despite the notions that the government could or should be run like a business, it is not a business. It is our government, emphasis on our. Travels with Tillerson could work for the news people and the secretary getting to know one another — providing an early warning that some new ideas might not be well understood or received. Experienced reporters might have warned him that Russian leaders often refuse to see American officials, although they rarely mean it. But bottom line, traveling with reporters is the right thing to do. It's not something to be done for a gaggle of reporters who didn't get to go to abroad. It's something to be done for the rest of us, who stay here but still need to understand what our country is doing.